When you the beard trimmer from Panasonic, you will have no doubts about its performance, quality and service. There are a lot of features that makes it stand out from average trimmers such as ergonomic design and quality of blades. The ER GB 80S is used by barbers and experts around the globe and you can get it for personal use as well. If you have bad experience with old beard trimmers, do not give up. This beard trimmer will let you style your face any way you like and bring back the confidence of using such devices again. You can tell that a beard trimmer is designed the right way when it will not fall even when your hands are wet and slippery. 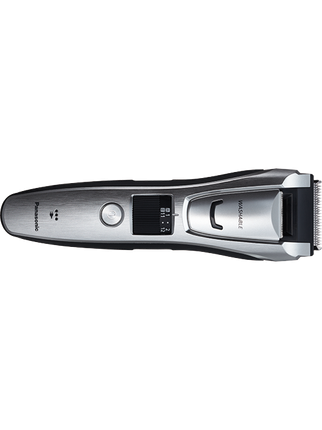 It comes with a sleek deign and user-friendly interfaces for trimmer length settings and charge indication. It has a lot of features for various uses and applications such as body hair grooming and trimming. It has a rubber grip which makes the task simple and easy. The trimming lengths will let you adjust them from 1 millimeter to 20 millimeters with differences of 0.5 millimeter. There are 39 settings to choose from so you do not have to worry about lack of options. Many beard trimmer have less options so the user has to stress about not getting the perfect look. The control spinner is at the center of the trimmer which lets the user have easy setting and access and make the trimming a pleasant experience. There is the type A comb which is from 1 millimeter to 10 millimeters which is utilized from grooming beards and mustaches with a close and sharp look. There is the type B comb which is from 10 millimeters till 20 that lets the user take care of long beard and hair of body. There is the 1.5-millimeter attachment which lets you groom the body in difficult areas such as the chest. They are set at 45 degrees’ angle to guarantee you that your trimming will be even. It comes with anti-allergenic blades that are made from stainless steel which makes it suitable for gents with sensitive skin. Since the blades are slanted, you have an extra benefit because it lets you take care of critical areas such as below the chin. It is suitable for wet and dry shaving so make sure to take care of your blades. You can charge it for an hour and expect it to run for 50 minutes. It has a Ni-MH battery which lets if run in a powerful and strong manner. The Panasonic beard trimmer is portable and you can take it on travel. There is a LED indicator to tell you the progress of charging. You can clean it under running tap water. It is easy to maintain because you have to hold it under the running water and wash it with the brush you get in the box. The brush is designed in such a manner that it will keep your device clean. You will also get a oil in the package which should be used every six months. This entry was posted in Panasonic on April 10, 2018 by Professional Beard Trimmer Reviewer.